A favourite London museum, now with an expanded mandate to include cycling, walking, taxis and river transportation, as well as the familiar Tube, buses and trains. The museum includes interactive exhibits, displays of historic posters, and the future of transportation. The museum is split in two parts. The main site is at Covent Garden, and is open daily throughout the year. The second site is in Acton, and is known as the London Transport Museum Depot, and is open only on certain days. The Covent Garden site occupies an historic glass and brick Victorian building erected in 1871 as part of Covent Garden's old flower market. At the turn of the 20th century the London General Omnibus Company started to preserve and collect buses as they were retired from active service. The LGOC was later absorbed into the London Electric Railway company, so the collection expanded to take in rail vehicles. As the organisation of London's transportation system evolved, the collection grew. Some of the rail vehicles eventually made their way to the National Railway Museum in York, but what is left traces the history of London's transport system from its origins in the late 19th century, up to the present day. See trams, trolleys, rail cars, and buses, plus posters, timetables, models, and transport equipment and tools from the early 19th century. One of the collection highlights is the very first underground electric train, launched in 1890. From the same time period is a 'padded cell' rail carriage. Then there's the familiar red London bus, both single and double-decker varieties. See the original artwork created by Harry Beck for the iconic London Underground map, plus advertisements, and a special display on the evolution of the roundel transport logo used on all London's transportation. 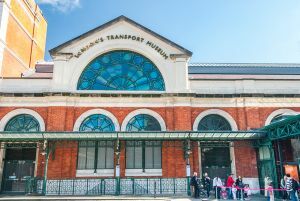 The museum follows several main themes, including 19th century London, which shows how people got around the city before the advent of public transport. From water taxis to horse-drawn cabs and trams, see how London's transport system evolved. The Steam Underground exhibit looks at the world's first underground railway, the Metropolitan, which launched in 1863 with a rail link between Farringdon and Paddington station. Learn why users of the underground steam transport system regarded it as a form of mild torture! The Growth of the Suburbs exhibit looks at how the growing city made use of existing rail lines, and linked overground rail and underground tube links. One fascinating part of the story is how the Metropolitan Railway became a property developer itself, building new suburbs with easy access to its rail lines. The museum traces the development of underground lines as they delved deeper into the earth, and served as larger and larger metropolis. See how the transportation system was used during both World Wars, and how the decrepit above ground system was reinvigorated with the introduction of the familiar Routemaster buses in 1959. Younger visitors will enjoy the chance to climb aboard real buses and trains. The museum is within the main Covent Garden plaza, and is within an easy walking distance of both Charing Cross rail and tube stations.